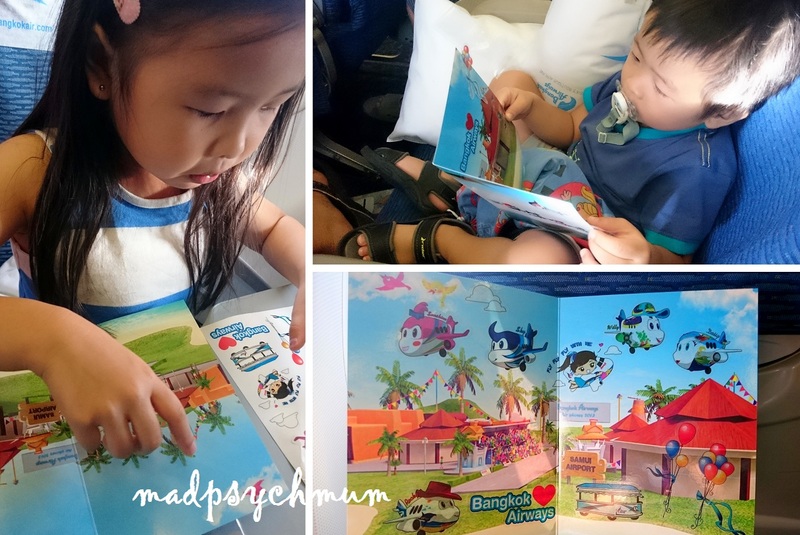 It was a trip that I had really looked forward to because we had not gone on a trip since our Tokyo trip last year (which was epic by the way) and a road trip to Malaysia doesn't really count! 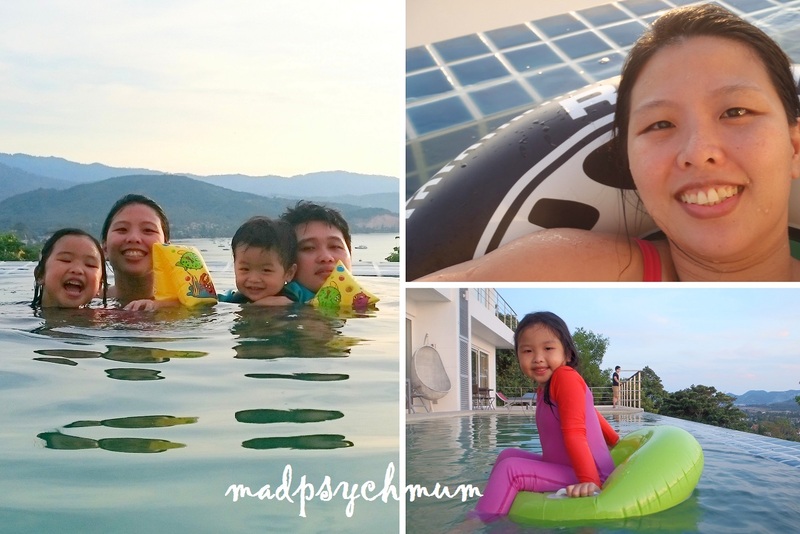 After months of meeting KPI after KPI, it was time for a good break where the only things to do on my itinerary were to eat, swim, shop and relax! We arrived at Changi Airport Terminal 1 around 3pm for our late afternoon flight at 5.25pm. Our favourite airline, Singapore Airlines, was charging waaay too much for their tickets so we decided to go with the cheaper Bangkok Airways instead. I kinda regretted paying so much to go during a peak period; although I highly doubt the price would be that much cheaper off-peak because the bulk of it went to airport taxes if I didn't remember wrongly. Well, at least it's a full service airline with F&B and seat selection! 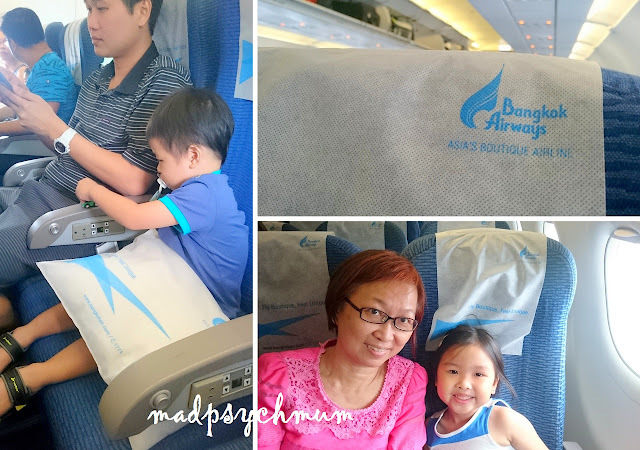 Girl and the Mum-in-law sat in the same row while the hubby, boy and I sat in the row in front. It was the first flight in 2 years that I haven't got an infant on my lap! It was sad (no more infant privileges *boo*), painful (for our wallets *double boo*) yet liberating (I'm freeee!) at the same time. I know, such mix of emotions is the cornerstone of motherhood. Why does the kid's meal always look sooo much better than the adult meals, which we weren't allowed to choose by the way (it was fish, take it or leave it). There's no entertainment (at least not in the form of individual TV screens) on board but they did give out sticker cards to occupy the kids for a while. Just as the pilot instructed, "cabin crew to your landing stations please", I caught a glimpse of the island of Samui (Koh means island in Thai) from my window. The island is so small that you can see most of it just before you land! To get this view, book a seat on the left of the plane facing front. I had also caught a glimpse of distinctive white buildings just before we landed, and those turned out to be our accommodation (more on it later) even though I had no idea then. We arrived safely at Samui International Airport at 6.10pm. 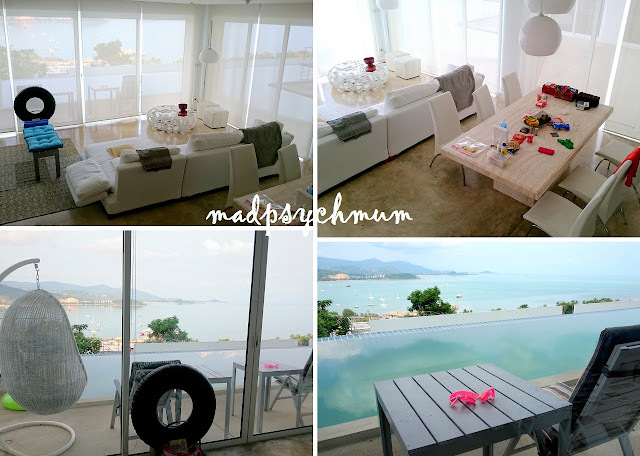 Koh Samui is 1 hour behind Singapore. In case you're wondering why you see Bangkok Airways everywhere in Samui International Airport, it's because the airport is operated by the airline! The airport also looks more like a resort than an airport! I knew we had to rent a car because our accommodation was located on top of a hill with amazing views but further away from town. It would not be easy getting a taxi from where we stayed. We rented a Toyota Vios from Thai Rent a Car at approximately S$40 a day. Do book in advance so that your car will be ready for you to pick up when you arrive. Once we've gotten our rented car, we were off to our accommodation, which we booked via Roomorama. 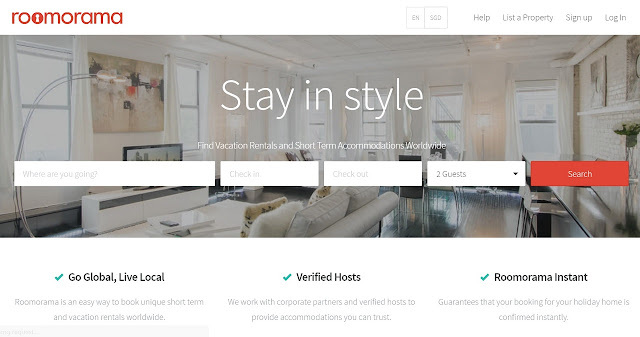 It's the go-to place to book value-for-money accommodations for large travelling parties (that would be too costly to put up in hotels) or people who just want something homey. Nursing mothers who need a freezer to store their breast milk should also consider apartments rather than hotels because most hotel refrigerators do not have a freezer compartment whereas apartment refrigerators do. 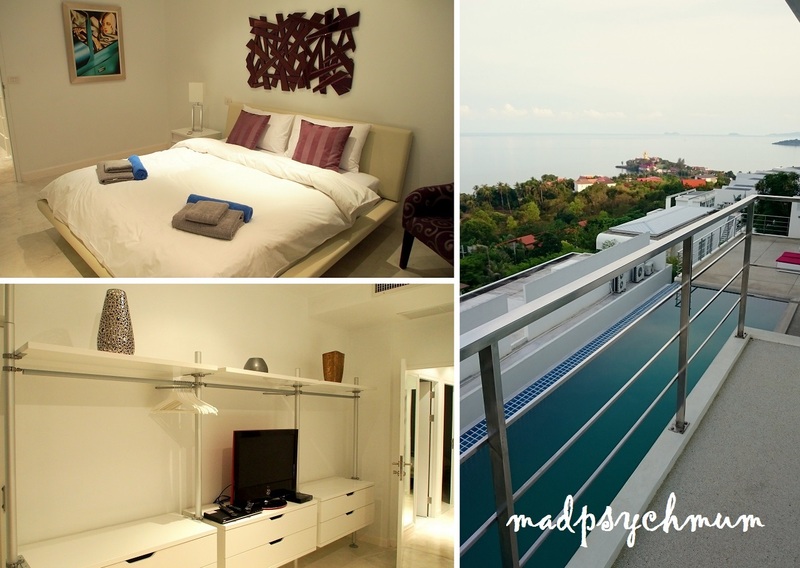 I chose a seaview two-storey apartment at Dasiri Unique because of the direct pool access and amazing views of the sea. 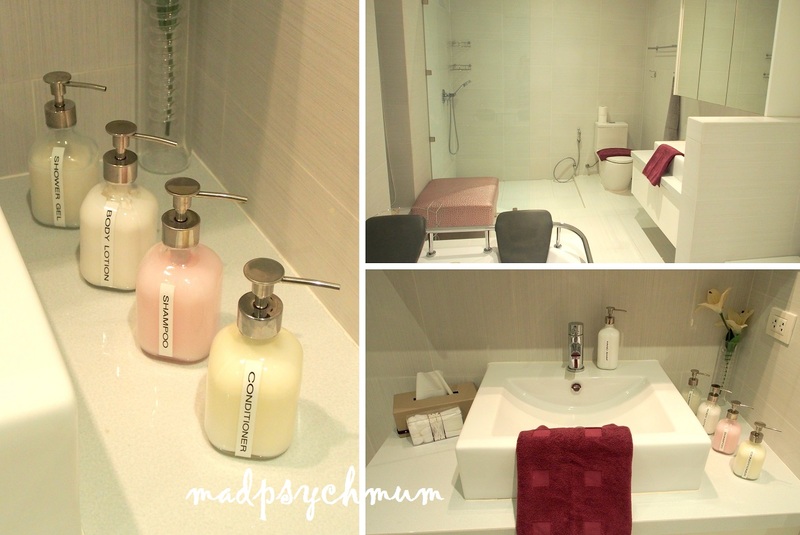 The 3-bedroom apartment costs about S$340 per night, which is very value for money if you're travelling in a large group (e.g. families with 4 adults and 3 children)! The hubby told me to get out of the car and take a look at what's happening because he can't really see. While I was out of the car directing him, he suddenly felt like he should step on the accelerator and try again. This time it worked! Thank God! We met up with the estate manager in charge of checking guests in and out of the apartments. I have to say, we were just happy to be settled into our accommodation after a long day. 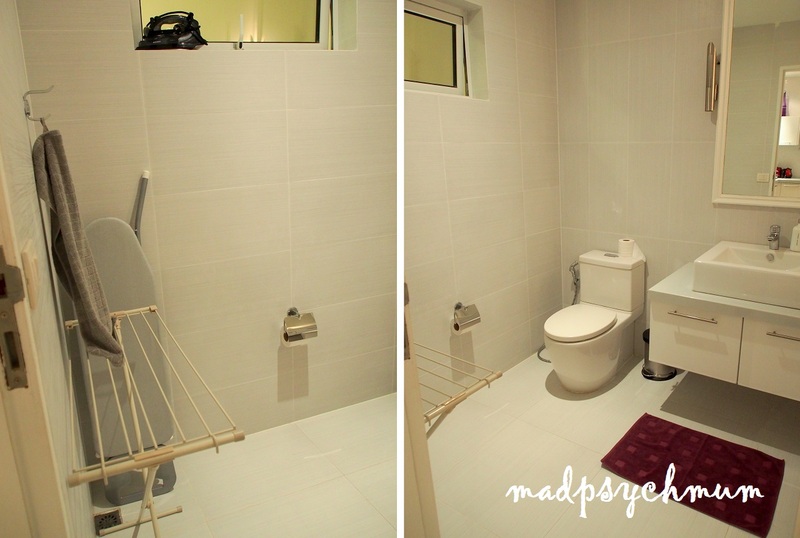 There are THREE toilets altogether in this apartment, with this one in the first level. A cool feature of this apartment is also a pure white winding stairs that lead you from the ground floor to the second floor. Of course, this very same feature was deemed a contraption for my super active 2-year-old! I actually lost my voice from shouting at him almost every hour, "NOOOO! STOP!!!!!!" #truestory. You can't trust a child younger than 4 years old with these steps! Adult assistance is compulsory! My girl, on the other hand, had no problems with it. 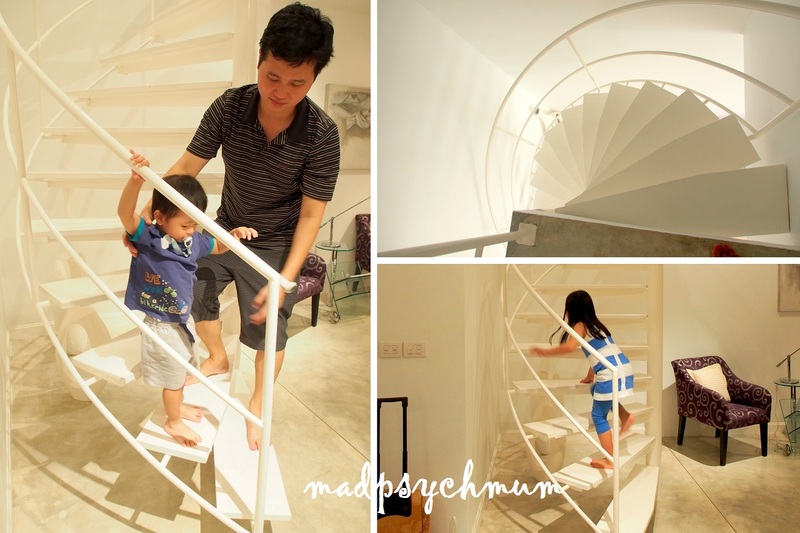 The winding stairs led to the second floor of the apartment, where the master and two bedrooms are located. The humongous master toilet, also with full amenities and even a jacuzzi (more on that later)! The balcony that allows you to admire the pool and the amazing views! 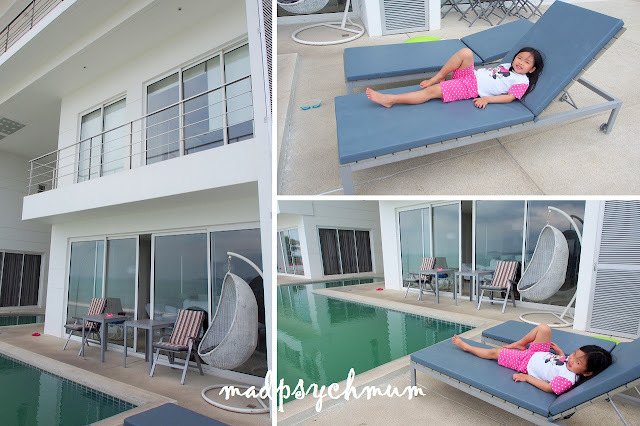 I went downstairs to check out how the first floor and the swimming pool looked in the day. Sliding doors that allow you to enjoy the view even from inside. The pool wasn't private but as the building only had 7 units, we literally had the whole pool to ourselves the whole time. The other units were either not occupied or had occupants who weren't interested in swimming, which I found really odd because you would think people booked apartments with direct pool access so that you can access the pool to swim! Dip and suntan, for those of you who love to suntan. Me, no thank you. The exterior of the building is a modern white. 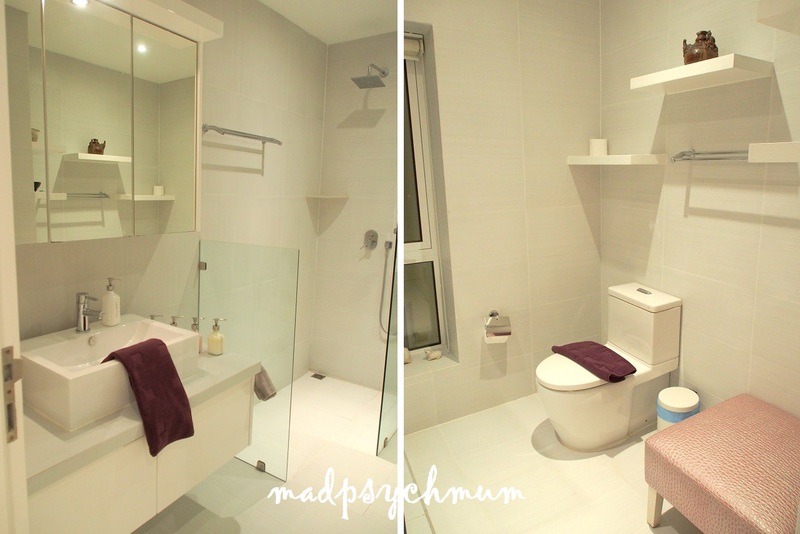 There are 3 levels in all, the first two levels are the 2-storey units and the third level is probably the 1-bedroom units. 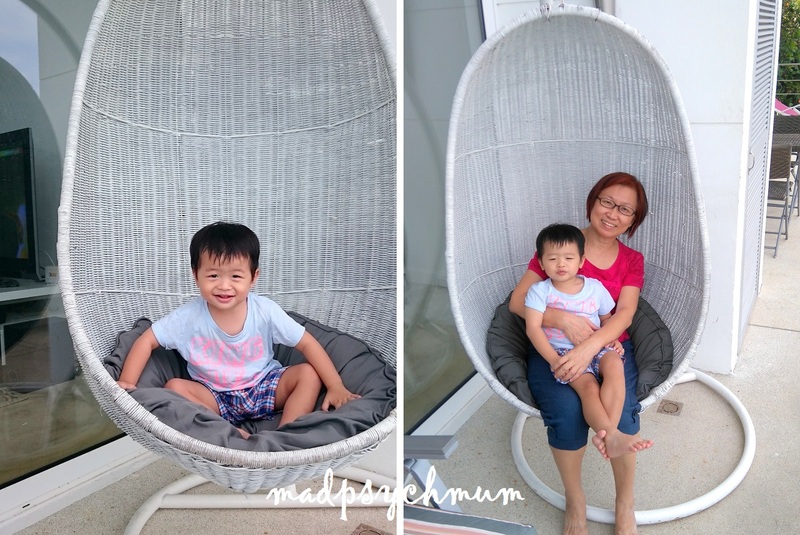 Lovely wicker swing chair - wish I had one of these in my home! Mum-in-law prepared breakfast for us with the food we had brought from home (since we didn't get a chance to buy any ingredients from a supermarket). The kitchen is really spacious and well stocked with amenities such as a full size fridge, toaster, utensils, microwave, oven and even a juicer. Mum-in-law loved the kitchen, which is always her favourite part of any house. The hubby thought we should run the jacuzzi to see if it works. 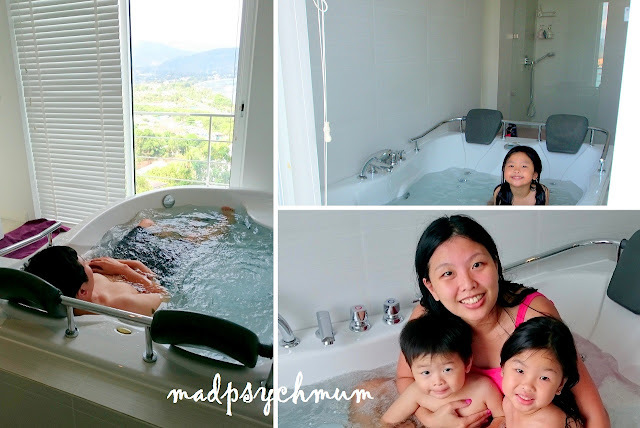 The jacuzzi faces the mountains and a bit of the sea, was super relaxing! Even the kids enjoyed it! Samui is an island plus the building is located on a hill so all the water that we use is delivered to the building via a water truck (not water pipes like in the city). We were also informed that Samui was experiencing drought, which meant that every drop of water was very precious. Hence, to conserve water, we decided to reuse the water again and again to prevent wastage. We were running out of food supplies so it was off to the biggest shopping mall on the island, Central Festival, to get our shopping done (more on the mall in the next post since we go to this mall almost everyday!). 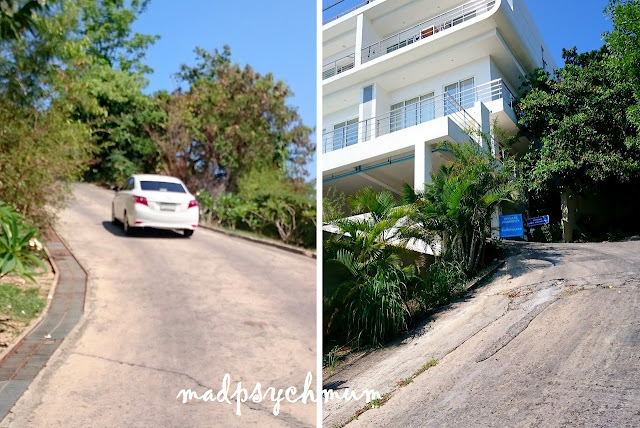 When we were done with our shopping, we headed back to our apartment where we were faced with the dreaded slope. The photos don't really do it justice but you can sort of see what I mean! 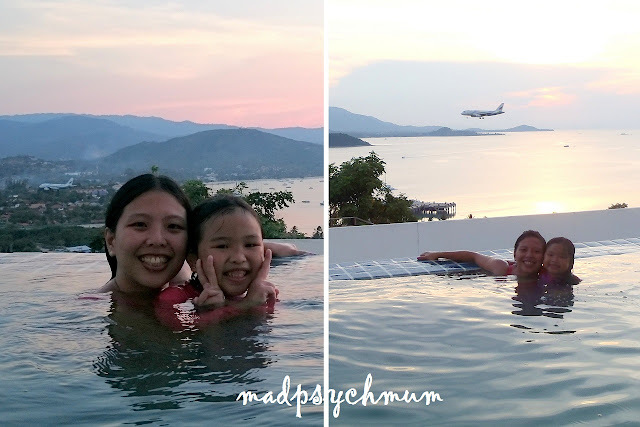 It was so hot in Koh Samui that we were ready to jump straight into the pool the minute we got back! Not really swimming but more like floating..
As we were right next to the airport, we could see the planes landing and taking off almost every 15 minutes! Not to worry, it's not very noisy. We weren't bothered by it at all (when you're indoors you can't hear it). Cheap thrill getting the hubby to catch us with the planes in the background every time we heard them approaching! If either you or your kids are into airplanes, this would be a great place to stay. They'll get to see them really up close all the time! We ended the day with Thai food that we 'dapao' (take away) from the food court at Central Festival. You'll be surprised how cheap and awesome the food from an ordinary stall at the food court is! 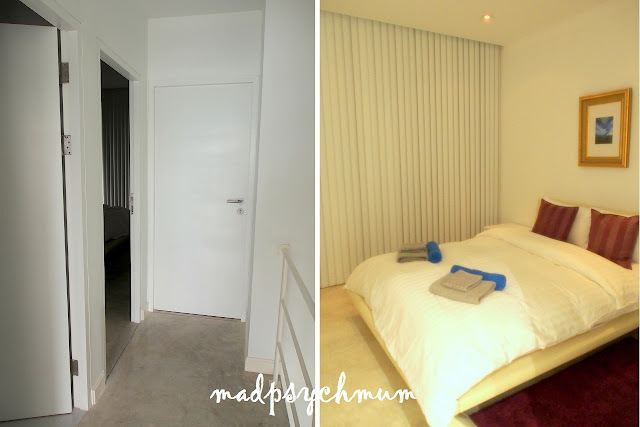 Overall, I have to say that the apartment was really true to the photos that were posted on Roomorama. We weren't disappointed at all! Disclosure: Complimentary accommodation for two nights (we paid for the third night) was received from Roomorama for the purposes of this review. No monetary compensation was received; all opinions are my own.